Lift in Ballynafeigh Community Development Association is broken causing access problems with service users getting to other floors. 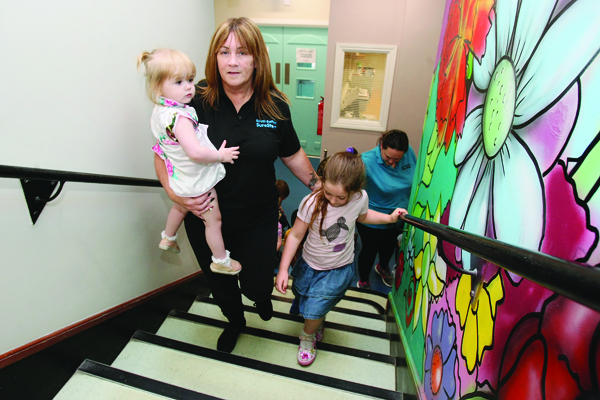 Emily Simms supervisor at Sure Start has to carry the young children up and down the stairs due to the lift needing repairs. A LOCAL development association urgently need to raise thousands of pounds to repair a lift at their newly renovated building to enable access to their user groups including the elderly, disabled and mums with prams. Residents who avail of the services at the Ballynafeigh Community Development Association (BCDA) currently can’t access programmes held on the upper floors, robbing them of support and facilities, including recovery groups, and staff are appealing to the community to help raise vital funds for the repair of their lift. Katie Hanlon, BCDA Director, said they have been actively fundraising over the last couple of months when it emerged funding for the repairs was unavailable to them at present, but they still have a long way to go. “Nobody is able to get up to the upper floors without great difficulty – children have to be carried whilst their prams are left in the ground floor, wheelchair users are at a loss, it’s just awful,” she said. “One woman suffered from a stroke and had to have another person carry her daughter up to the crèche for her. “Everyone here was so excited as we have just completed a major renovation enabling our users to access the building through the front door for the first time in many years, then unfortunately a few weeks later the lift gave up. “We have been actively fundraising on crowd funding websites and reaching out to the local community. Through Just Giving we have raised £500 and through local funding over £1,000 but a basic repair requires around £8,000. A new lift would be far too expensive at around £26,000. Ballynafeigh Community Development Association is a community development association in South Belfast whose core aim is to create and deliver social action to tackle disadvantage and address issues that impact on vulnerable individuals and groups. Established in 1974 the Association’s work has focused on their role as a multi-purpose organisation, operating a resource centre and acting as a catalyst for the creation and delivery of social actions to tackle disadvantage and address those issues which impact on development and quality of life matters for vulnerable individuals and groups. Their vision is of a vibrant neighbourhood with a generous spirit, supported by a dynamic community association, which acts as a catalyst for change and development. “People need this organisation for support from the advice centre, to the crèche and from gamblers anonymous to health and wellbeing. We have high demands in here covering everything from parents’ groups to AA and it’s just not fair for those users to suffer because they cannot access the upper floors due to a lift repair,” explained Katie. “We have 200 user groups. We have groups including adults with learning difficulties who don’t understand why they can no longer access their garden on the roof for dance class and so on. One parent said she thought it was “ridiculous” funding wasn’t available for the “vital” repair. “People who are disabled, mothers with prams and more use this centre every day and I think it’s ridiculous that they are not giving funding to the community that use the lift which is vital for some people,” she said. South Belfast MLA Máirtín Ó Muilleoir commented: “I commend the enthusiasm, positivity and tireless contribution to the community by Ballynafeigh Community Development Association which has been the backbone of the most integrated community of Belfast for many decades. “The good community relations in Ballynafeigh are themselves a testament to the heroes of this community organisation and I was delighted to visit last week again and meet some of the user groups. “However, it’s crucial that the authorities match the generosity and big hearts of this association by stepping up to repair this lift.